We were very close with our prediction for the starting XI on Friday so we're going to have another go. This time however, we're significantly less confident of second guessing Martin O'Neill. The Ireland boss has confirmed that Shane Long is available but it's surely asking too much for him to come straight back into the starting XI having not played since the Poland defeat. However, John O'Shea, back from suspension, but still feeling the effects of that hamstring injury, gives O'Neill a big decision to make. John has done a significant amount of work and that’s fine; Shane less so but the very fact that the two of them are here now is good news for us. Sam Allardyce was dismissive of any possibility that O'Shea would be available after he aggravated the injury a little over a week ago. However, O'Neill's suggestion that the 34 year old has done a 'significant amount of work' could be telling. If O'Shea was in as bad a shape as Allardyce was suggesting, you have to think he would be doing next to no work alongside Long. Is it worth the risk pushing him to be fit if there was no chance he would start? O'Neill is not 100% convinced of Ciaran Clark's ability to hold down a slot at centre back and despite the fact that he and Keogh did an adequate job of dealing with Dzeko in Zenica, any chance to get O'Shea back in will, and should, be jumped upon. If that does happen, then there's even more of a decision to be made at left back. Brady is a midfielder again, that has got to be a certainty. Ward was barely able for 60 minutes on Friday so he's out also. That leaves Wilson or Clark. The Aston Villa man has played more football this season but his international appearances at left back have been practically non-existent. We're opting for Wilson. Further forward, Jon Walters is coming back and damn do we need him. The only question is where. Shane Long is unlikely to be fit having barely trained and Daryl Murphy was less than impressive, in his admittedly thankless task, in Zenica. We need Walters up top more than we need him out wide. We need to ensure that when the ball goes forward, it sticks. Walters is your man. The only question is, will he have player's playing directly off him or will he be battling it out alone. 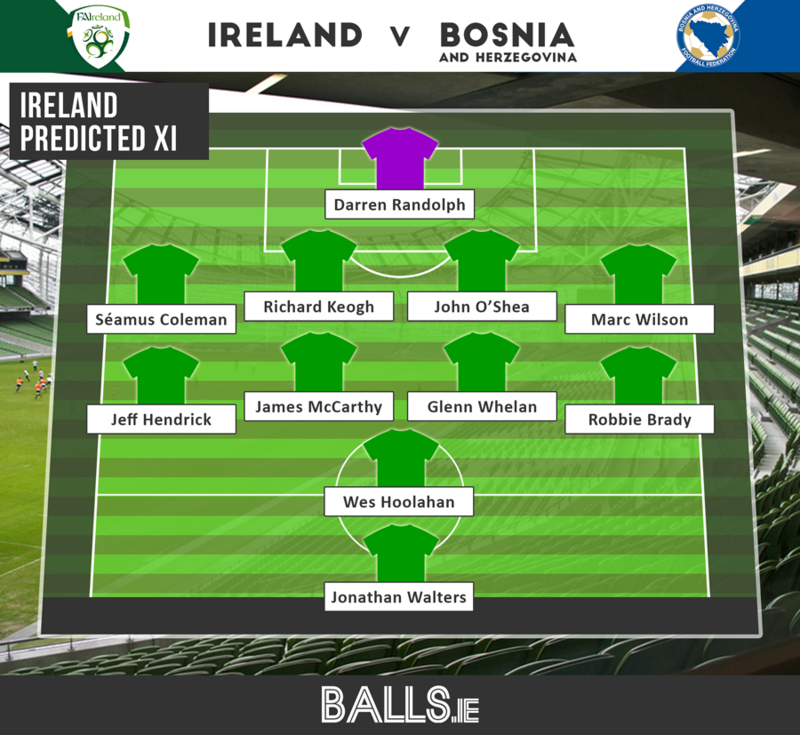 After his cameo in Bosnia, James McClean may be in line for a start at the expense of Jeff Hendrick. Get the West Brom man going forward and we're likely to be more of an attacking threat. However, this is still about keeping things tight and McClean's role in Bosnia's goal won't have delighted O'Neill who we're going to assume will stick with the relative solidity of Hendrick. Instead, in support of Walters, we're going to assume that Wes Hoolahan will be giving licence to play in the opposition half more so than on Friday. Having said all that, O'Neill does like a surprise so we won't be banking on this one.